Villathis property is an elegant and welcoming apartment immersed in a splendid landscape, in the heart of a wonderful little town. It sleeps six people. From Villathis property you will enjoy a broad view of the valley and of the greenery. Villathis property is 60 square meters (645 square feet). It features a shared swimming pool, two panoramic private terraces, a shared garden, air conditioning (please read description below to check in which rooms the units are installed), winter heating and WI-FI Internet access. You will be in the center of San Baronto, a few meters (feet) from restaurants, shops and public transportation. Villathis property is located on the top floor of a three story building. You will reach it from Villathis property using an elevator and then going up a walkway that includes approximately 20 stairway steps. To stay at Villathis property you will need a car. You will be able to park it free of charge in a parking space. Villathis property is one of the holiday homes available in a small complex. Please find a general description of the complex below, and please scroll further down for a description of Villathis property. Villa Floriana is a beautiful villa built as a vacation home. It features terraces facing the sun and the wide scenery of the valley and the hills. It is at about 400 meters (about 1,312 feet) of altitude in a prominent position on the slope of a hill overlooking the valley of Valdinievole, formed by the river Arno. The villa is in the middle of a small “fraction-town” of San Baronto. You will be on the hills of Montalbano, not far from the sea. Only 40 km (about 25 miles) away, you will find the small town of Viareggio, famous for its splendid beaches. The scenery around the villa is one rich in hills, with vineyards covering the lower areas, olive groves on the slopes, and woods of chestnuts and oak trees on the top. The Chianti wine of Montalbano is produced in the area and there are several wine cellars around. Amidst the green, you will see elegant villas and beautiful farms which offer hospitality to tourists: the area boasts many trails and cycling paths. You will be close to Florence, Pisa, Lucca, Siena, and San Gimignano: you can even search for the cities or art of Tuscany and also its beautiful castles and historical hamlets on convenient daily visits or excursions. During your stay at Villa Floriana, you will be in a territory whose history dates back to the ancient Romans and which has preserved, since the year One Thousand, historical castles, churches, villas and palaces rich in master pieces, all to be absolutely visited. You will also be near the small town of Vinci, birthplace of Leonardo da Vinci. You will be in the area where the Chianti wine is produced. And as an addition to all the cultural visits, don’t forget to stop at the beautiful wine cellars of the area while taking the “Strada del Vino” (Road of the Wine). Don’t miss out on having lunch in one of the characteristic trattorias, often attended by local people and where you will taste the genuine Tuscan cuisine! The swimming pool is 6 meters (20 feet) large by 12 meters (39 feet) long. The area is equipped with a table, chairs, sun umbrellas and sun loungers. 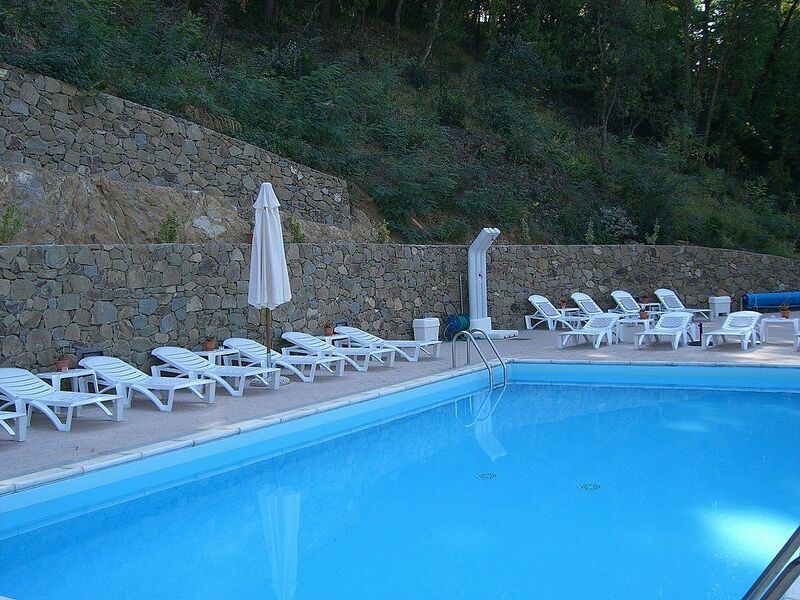 From the swimming pool you will enjoy a broad view of the valley. You will share the pool with the other guests staying at the complex. The swimming pool is open from the beginning of May until the end of October. The terrace is partly shaded by retractable awnings. It is equipped with a table, chairs and two sun loungers. From the terrace you will enjoy a characteristic view of the valley. The furnishings of the living room are elegant. The furnishings include a sofa and a divan that unfolds into a double bed. In the living room you will also find a cooking area. The kitchenette is equipped with a two-burner electric cooker, a refrigerator with freezer and an Italian-style coffee-maker. The dining table can accommodate four guests. In this room you will find a satellite television (local channels). From the living room you will be able to enter the terrace through a French door. The room also has two windows. It is equipped with an air conditioning/heating unit. You will be able to enter the first bedroom living room through an access area. The bedroom has a matrimonial bed (160 cm/62 inches, wider than a queen-size bed). From the bedroom you will be able to enter a second terrace through a French door. You will be able to enter the second bedroom living room through an access area. It has two twin beds (80 cm/32 inches). The bathroom is equipped with a washbasin, a toilet and a fully enclosed shower. You will be able to enter the bathroom living room through an access area. This is a beautiful 2 bedroom property located in Tuscany, Italy. This villa, in San Baronto, boasts gorgeous valley and country views sleeping 6 people. The villa offers superb accommodation, including modern luxuries such as a community pool, internet access, air conditioning, television and an open terrace.